Before you send a SMS campaign, you should build your group. Enter the [Campaign] section, click [Create SMS Campaign] at the top right corner. Name your campaign. Campaign name will not be shown in the SMS message body. Set your [Sender Name], then choose a group or create a new one. Sender name can be any case sensitive alphanumeric strings (0 - 9, a - Z) up to 11 characters or numeric only strings up to 14 characters. The empty space character " " is accepted but not recommended as some phones may not be able to interpret this. To choose multiple groups, press and hold the Shift or Ctrl key. An unsubscribe message can be appended at the end of your message content. Choose a message style and fill in your contact number for unsubscribe. If a person requests to unsubscribe from your message, simply search or look into his/her contact profile, identify and click its [Subscription Centre] button, then proceed accordingly to update his/her preferences. 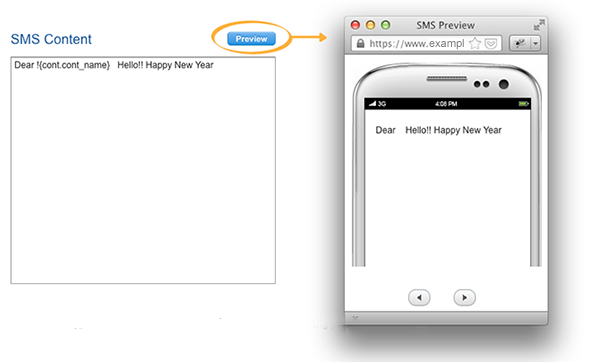 Click the [Create SMS Template] button in the [SMS Template] field to create a new SMS template. Learn more about how to create a SMS template. Alternatively, you can choose an existing SMS template. You can write the SMS message in the editor directly. While you are writing, the system counts the number of SMS messages it will consume and characters left. If you want, you can personalize the message with data fields. Choose fields and insert its code to the right position. Now you can click [Preview] to verify the content in the browser. Click the [Test Send] button to send a testing version of your SMS message to your Test Send Group. Unlike email campaign, credits will be deducted for sending test SMS messages. You can exclude contacts, modify notification and tune other campaign configurations by clicking the [Advanced Settings] button. Finally, when everything looks great, you can save, schedule or start the campaign immediately. If you are just drafting a campaign, you can choose [Pending]. All your settings will be saved but the campaign will not be sent. You can choose [Start Now] to send the campaign immediately. Otherwise, you can choose [Schedule] to start the campaign at a later time. To control how fast all messages should be sent, you have to specify the interval between each SMS message delivery. When everything is ok, click [Save]. You can also set up [Send Periods]. Campaigns will be limited to run within [Send Periods] only or otherwise suppressed automatically. 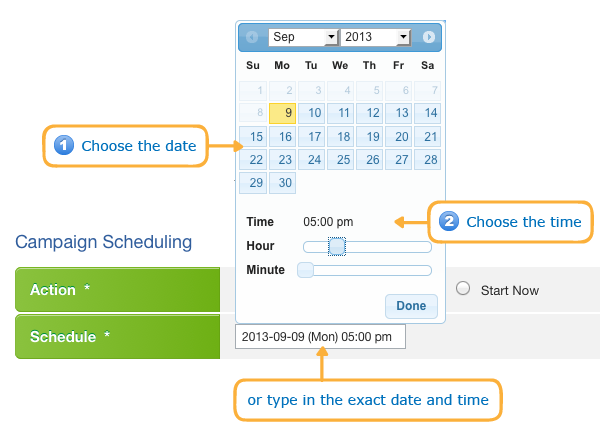 Learn more about Delivery Timetable.